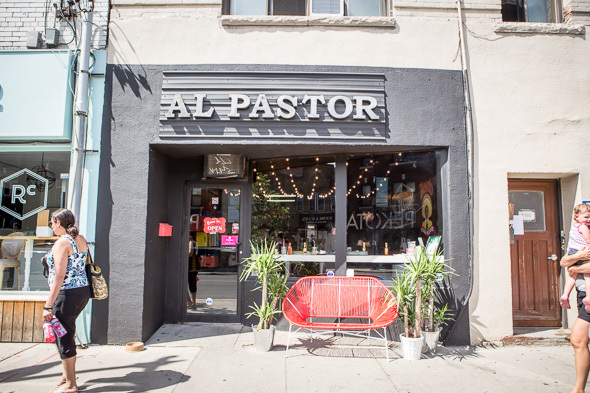 Al Pastor might just be the most popular type of taco in Mexico, but now it's also the name of a Toronto restaurant in the Junction. 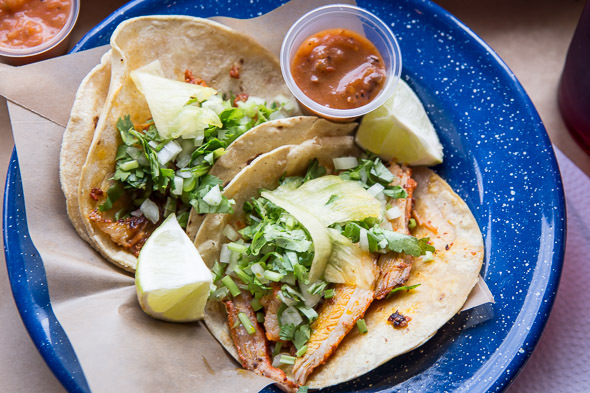 The fast-casual taqueria is owned and operated by Alain Frederick Jacques Vanessa (formerly at CafeterĂ­a , plus a long list of kitchens in Mexico, Montreal and New York) and Enrique Gonzalez (ex- Modus , La Societe ). 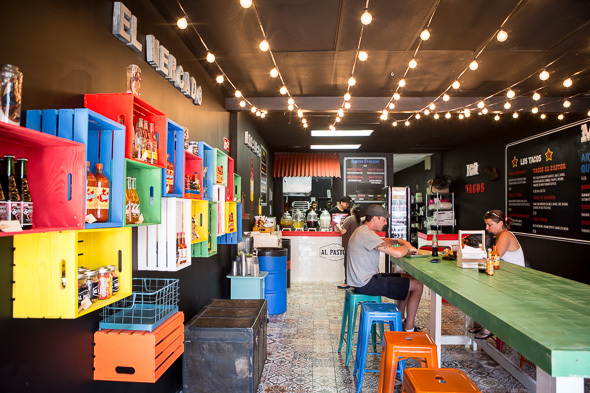 Their new, brightly coloured spot features tiled flooring, a rainbow of Tolix stools and a mini mercado lining one wall. 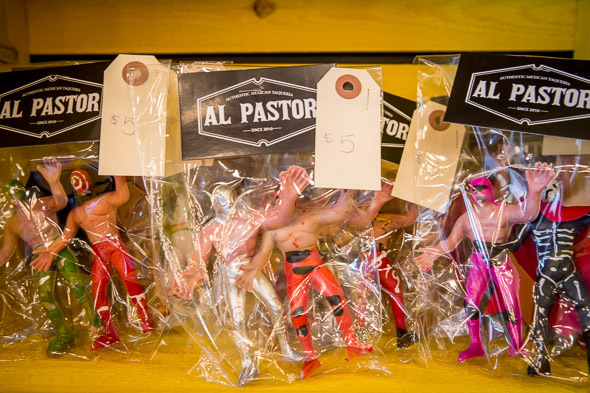 Luchador action figures, candies and hot sauces imported from Mexico are among the select items for sale. The menu painted on the wall bills tacos, quesadillas and burritos. Al pastor is of course the star. The pork shoulder is brined and then marinated in three types of dried chilies, pineapple, orange juice, roasted garlic paste and red wine vinegar. Like shawarma, the meat is cooked slowly until it's juicy and caramelized. Afterwards, it gets shaved off the spit and lands on a corn tortilla. A single al pastor taco sells for $3.50, but it's $10 if you want four. Other tacos on offer include brisket-chorizo ($3.50), chicken ($3.50), steak ($3.50), and oaxaca cheese with fried chorizo ($9 for 3). The vegetarian option ($3.50) is like a meatless fajita loaded with sautĂŠed mushrooms, onions and peppers. 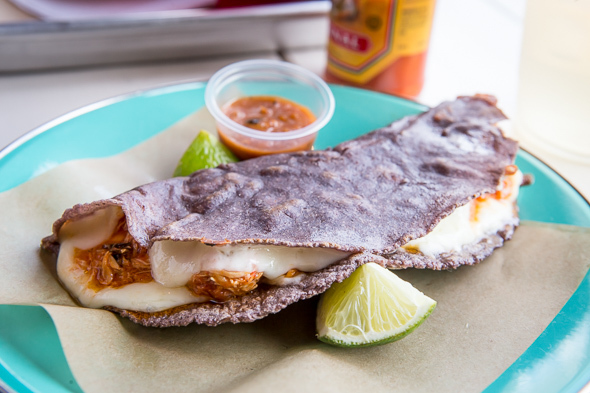 From the lineup of quesadillas ($6.50), I try the chicken tinga featuring a freshly pressed blue corn tortillas folded around gooey oaxaca cheese with shredded meat stewed in tomatoes with garlic, onions, oregano and chipotle peppers. 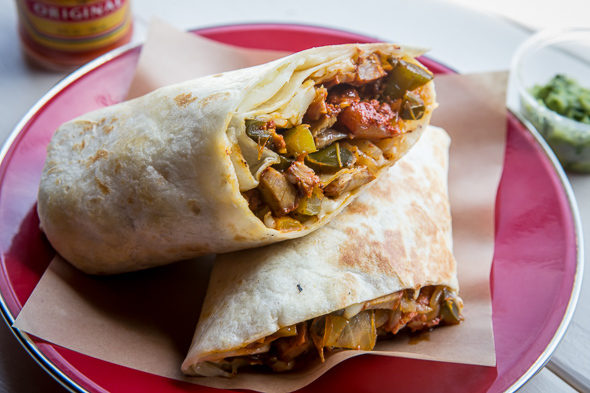 Not to miss out on another opportunity to eat more of the delicious al pastor, I also have it in an alambre burrito. These are bean-less and rice-less bundles loaded with nothing but chunks of meat, cheese, onions and poblano peppers. A little container of gauc' is included on the side for dipping, which adds a cold creamy counterpoint to the hot, cheesy mass of meat wrapped in a flour tortilla. 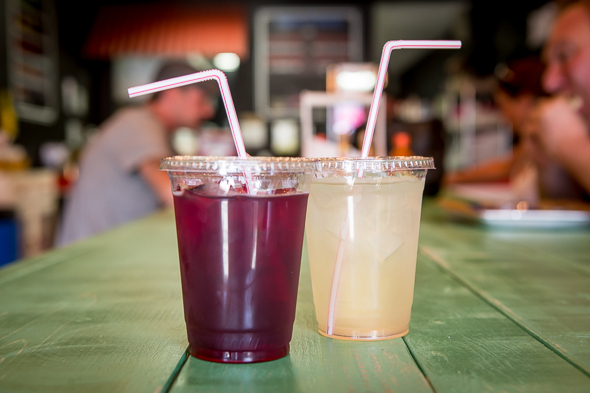 To drink, there's imported sugar cane sweetened soda as well as three types of house-made agua fresca ($2.50). Horchata and Jamaica I'm already familiar with but then there's a new discovery; tepache, a fermented pineapple rind refreshment scented with vanilla and cinnamon. What a knockout pairing; tepache and al pastor tacos! Pineapples everywhere should be proud.